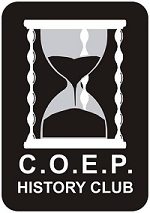 COEP History Club is a platform for students of COEP to conduct and enjoy activities related to current historical events and important social situations and their historical context. The club organizes many site visits and treks to places of historical significance. These tours are guided ones and different field experts or prominent historians are taken along. The COEP History Club which has ties with Bharat Itihaas Sanshodhak Mandal and Itihaas Premi Mandal, is a social activity pursued by the students of COEP vigorously over last four years out of their passion about history. The club holds regular sessions on various topics such as Troy, Mahabharata, Maratha History, Historic love stories, Joseph Stalin and the likes. Along with these all activities, club organizes ‘Annual History Quiz’, where knowledge of COEP students about local and national history get tested and the winners are awarded handsome cash prizes. Students having keen interest in any aspect of history can join the club. No auditions are required.